With the sharpest fall in two and a half years, June's Construction PMI crashed down to 48.2, sinking far below forecasts (and hopes) of a 53.0 reading. 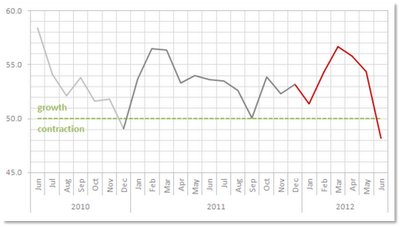 The reading fell below the 50 mark (which separates growth from contraction) for the first time since December 2010. June had seen some abnormal external factors, with the extra bank holiday for the Queen's Diamond Jubilee and severe weather across large parts of the country. However, with sharp falls in new civil engineering and housing activity (and the decline in commercial activity not far behind), senior economist Tim Moore said that these temporary factors were not to be overplayed, as the figures reveal worsening underlying business conditions within construction. From an employment perspective, things were not looking any better. With little new work to replace existing projects, a drop in construction employment was inevitable and figures revealed the first fall in workforce numbers since February.